We’re doing a sprint workout today that we wanted to explain. You would first need to figure out how long it takes you to swim a 100 free. 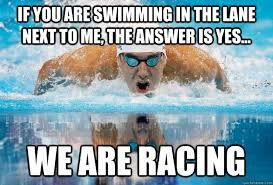 If it takes you 1:30, then you would swim a 25 in approximately :22. You would then try to sprint your 25s in :22 and rest (RI) for :20 between each 25. If this is too much to think about, just sprint them without worrying about your pace.